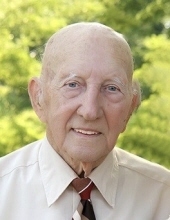 Joseph J. Kania passed away on his 92nd birthday, January 26, 2019. He was preceded in death by his wife of over 62 years Grace (nee Zalokar), his parents Frank and Victoria (nee Antos), his brothers John (Estelle), Henry (Loretta) and Edward, and his sister Ann. Joe is survived by his daughter Linda (Michael) Pillatsch, grandsons Joseph and Matthew Pillatsch and Joe’s brother Peter (Connie). Joe was born and raised in Chicago’s “Back-of-the-Yards” neighborhood. He graduated from Tilden Technical High School in 1945. He and Grace settled in Elmhurst and lived there for over 30 years. In the late 90’s they moved to Carillon in Plainfield. Joe spent his last years at Spring Meadows in Naperville. Joe’s hobbies included playing 16” softball in his younger years, fishing, woodworking and stamp collecting. He enjoyed the outdoors and spent many weekends at local forest preserves and vacations at family lake homes in Michigan. Most of all he loved watching his grandsons play basketball, soccer, and especially baseball. He could always be seen in his lawn chair keeping track of the progress of every game in his spiral notebook, quick to answer a question on the score or the hitter’s count. Joe was proud of his service in the U.S. Army. He was drafted shortly after finishing high school and served in occupied Japan from late 1945 through 1947. In lieu of flowers, donations in Joe’s honor may be given to a Veteran’s organization of your choice. Family and friends will gather Monday, February 4 for 4:00 PM Memorial Visitation until time of Military Honors 7:00 PM at Friedrich-Jones Funeral Home & Cremation Services 44 S. Mill St. Naperville, IL 60540. A private inurnment will take place at a future date at Abraham Lincoln National Cemetery, Elwood, IL. To send flowers or a remembrance gift to the family of Joseph J. Kania, please visit our Tribute Store. "Email Address" would like to share the life celebration of Joseph J. Kania. Click on the "link" to go to share a favorite memory or leave a condolence message for the family.